(Fort Lauderdale, FL)- The third week of January has traditionally marked the start of the American offshore sailing season. 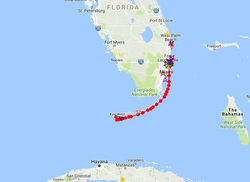 That event is the infamous Fort Lauderdale to Key West Race, a 160.0nm dash down the eastern Florida coastline, bound by the Florida Keys reefs to starboard and the swift-moving 4-6 kt Gulf Stream off to port. The Storm Trysail Club and Fort Lauderdale YC host the event. The fleet will start on Thursday, January 17th, at 1000 hrs. It is always a challenging race in light or strong breezes as teams are forced to sail in a narrow band of water to avoid the adverse, northerly-flowing, Gulf Stream currents and the precipitous walls of coral on the northern side of the course that are the Florida Keys. The race track is simple enough, start off the Ft Lauderdale inlet, then head south to several key turning marks to be left to starboard- 68.0nm to Elbow Key Light, 12.0nm more to Molasses Reef Light, 53.0nm more to Sombrero Key Light, 45.0nm more to Key West Channel buoy #2, then a short 6.0nm sprint north up the channel to the finish off Truman Annex Navy base. Because of the current off Key West (a channel that seemingly has half the Gulf of Mexico empty through it), the last 6.0nm can often be the most frustrating in the race in an ebb tide and light winds! After the first two races, the Nassau Cup Race (from Miami, FL to Nassau, Bahamas) and the Wirth Munroe Memorial Race (from Miami, FL to Palm Beach, FL), the leaderboard has three J/Teams in the top four! Leading is Chris Lewis’ J/44 KENAI from Lakewood YC in Seabrook, TX. They are followed by the J/92 HILLBILLY in 3rd place, sailed by Brad Stowers from Melbourne YC in Melbourne, FL. And then, lying in fourth position, is the J/109 HARM’S WAY, sailed by Andy Wescoat from Galveston Bay Cruising Association in Spring, TX! Joining them for the this overnight blast around the Keys will be Matt Schaedler’s J/122 BLITZKRIEG from North Cape YC in Toledo, OH and also Matt Self’s J/105 RUCKUS from Charleston YC in Daniel Island, SC. 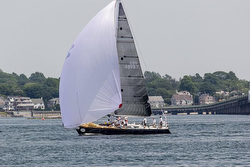 Follow the SORC Series on Facebook here For more SORC Key West Race sailing information Add to Flipboard Magazine.